This has been a post I have been thinking about for some time. I have received a few questions from readers about paint colors to update their homes before selling. And as some of you know we bought a fixer upper a couple of years ago, and although we enjoy living where we do, we came into this house knowing that it would not be our forever home. So when deciding paint colors, flooring, lights, etc. I have tried to pick out items and colors that other people would like as well. So whether you are trying to flip a home, or you need to update your paint colors for resale, or you just want a good neutral color scheme…this post is for YOU. This palette is a great place to start with paint colors that work well in the rooms listed above. It’s designed to stage a home to sell with it’s clean, neutral colors. Have you seen this? Revere Pewter is definitely a safe, tried and true color by not only Christina but it is one of the most popular colors here at Favorite Paint Colors. (See all of my Revere Pewter posts here) I have yet to see it in a space where I don’t love it and is sure to attract potential buyers. Update: After trying dozens of paint colors for our new home, see this post to find out why I chose Revere Pewter to put in our main living area. It’s still one of my favorites. Here is an interesting article on how to get more money from your home using certain paint colors…Business Insider. The graph above shows how certain colors can add value or decrease value from your home’s sale. Red dining rooms and yellow kitchens? Noo thank you. Last but not least, here are 10 colors to paint your home to boost your resale value. These 10 paint colors are all aesthetically pleasing to the eye and should work well in any room in your home. Do you have a paint color that everyone just loves? Let us all know! Happy painting, selling and moving! Want more ideas and inspiration? 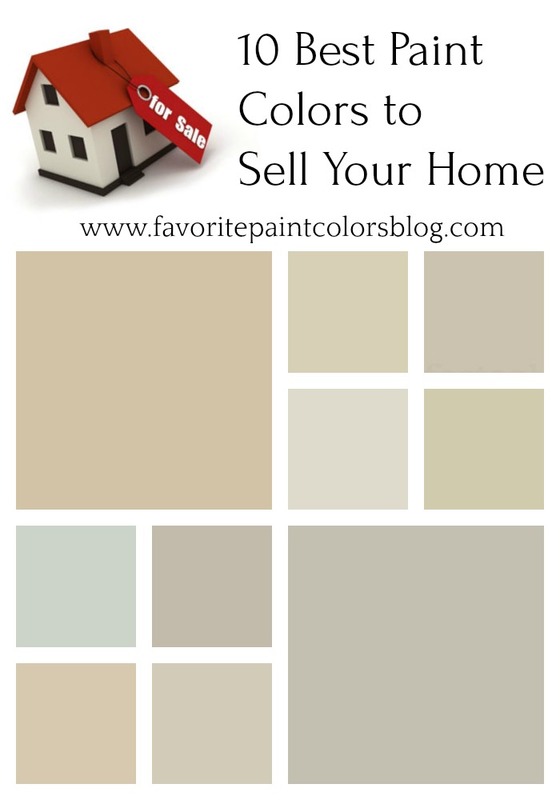 See a realtor’s top 4 paint colors for selling a home here.